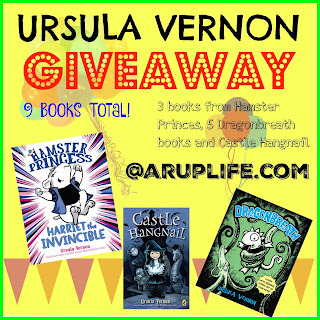 A RUP LIFE: Ursula Vernon's Hamster Princess Review & Giveaway!! 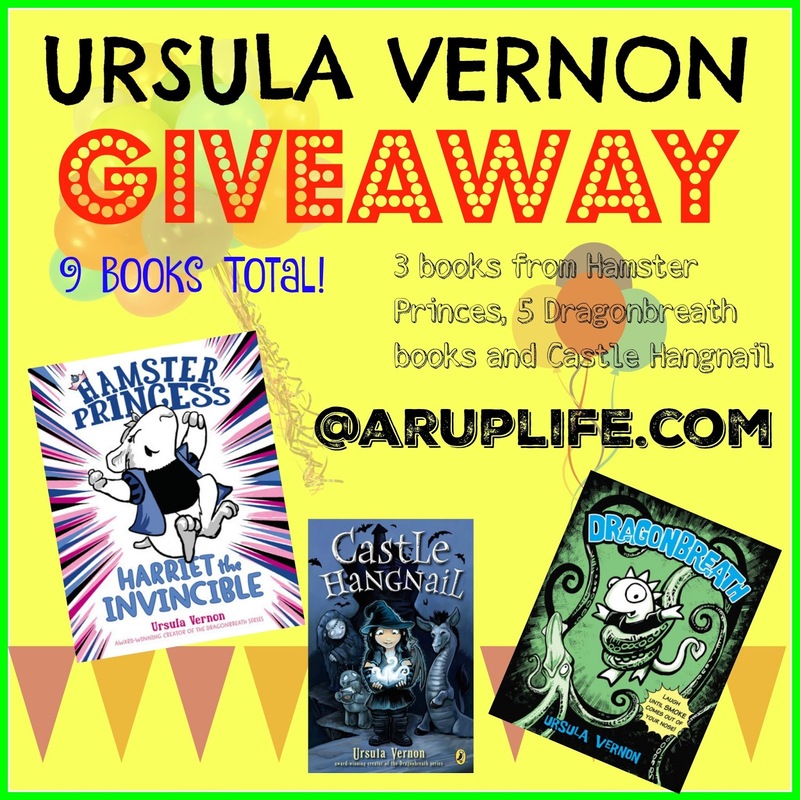 Ursula Vernon's Hamster Princess Review & Giveaway!! Summer is just around the corner and I know many parents will be looking for reading inspiration for their children. I was recently sent three of Ursula Vernon's books. 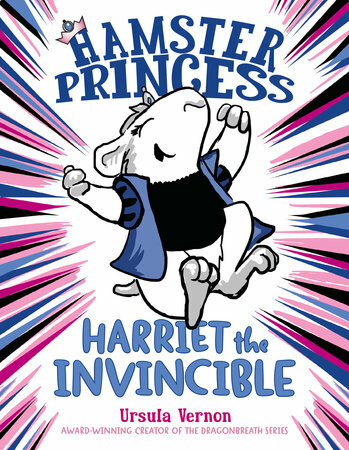 One of them is - Hamster Princess Book 1 - Harriet the Invincible. Naturally I had to crack open the cover and give it a read. I mean look at that cover art! Pink Purple and glitter! This particular story is a take off of sleeping beauty and Harriet is our princess. Featuring 26 chapters in a mixture of a chapter book and a bit of a graphic novel, this book is just plan fun. This is a fast paced book and Harriet is a feisty protagonist! Little girls every where will love reading all about her! 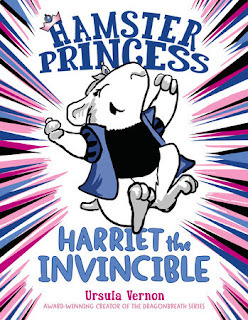 Harriet Hamsterbone, aka Hamster Princess, garnered four starred reviews for her role as the heroine of Harriet the Invincible, a reimagining of Sleeping Beauty. Following the critical acclaim that greeted Harriet the Invincible upon release, the book appeared on numerous “Best of” year-end lists and earned several award nominations. Now, in Of Mice and Magic, Vernon brings readers another epic adventure full of laugh-out-loud escapades, this one a fresh take on the classic tale The Twelve Dancing Princesses. It’s no wonder that Harriet is such a hit: she is most definitely not your average princess. She does not excel at traditional princess arts such as needlepoint or looking ethereal, and she’s a terrible damsel in distress. She does the rescuing...when she's not jousting, cliff-diving, or fighting ogrecats, that is! One lucky reader will win a Ursula Vernon prize pack! This includes: the first two Hamster Princess books, and advance copy of Ratpunzel, a copy of Castle Hangnail, and the first five books in the Danny Dragonbreath series! My kids like Harriet the Invincible. I think my daughter would love the Ratpunzel Book! Castle Hangnail looks like a good book my daughter would enjoy.